The quickest way to zap sock phobia is to get together with a bunch of friendly knitters and cast on for socks -TOGETHER!! That’s exactly what a few of us from the UAE Knitters Ravelry Group did this past Friday afternoon. It was wonderful getting together with these wonderful women and no two people in the group were from the same country – that’s knitting diversified…AMAZING!!!! We had Jocelyn, Hala (who was sweet enough to make the two hour drive to Dubai all the way from Abu Dhabi), Debbie, Jackie, Caroline, Rain, Jennifer (with her adorable daughter) and me. There was plenty of oohing and aahing going on with all the lovely stash that everyone brought along. 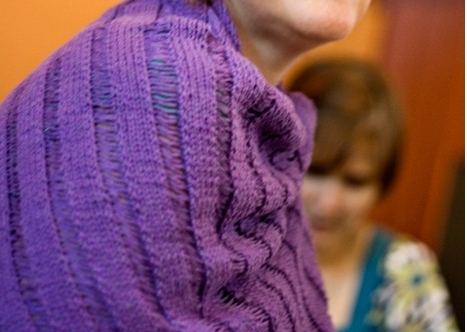 There was Argosy yarn which was so gorgeous that we considered if we should we skip the knitting and just wear the yarn instead. No, we love knitting too much! That was not all, she brought along her Hurricane Hat in Malabrigo worsted that she so aptly calls The Power of Nine. Then there was Rain’s gorgeous Purple Halter which is almost done. 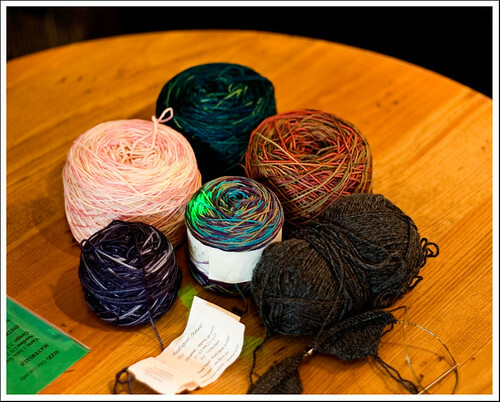 We didn’t forget the socks though….here are almost all the sock yarns that everyone is going to be using. I say almost, because Caroline was being a good girl and swatching for hers and so her yarn is not in the picture. 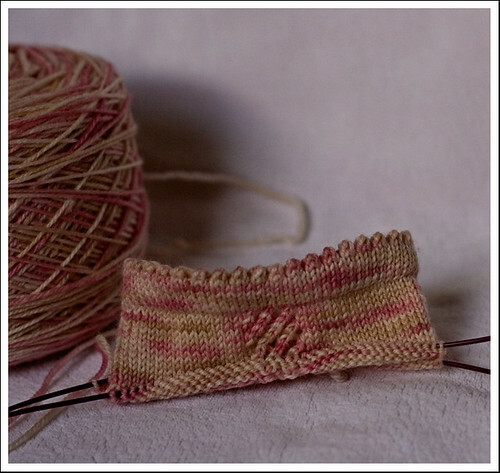 I don’t think that the rest of us swatched – we just cast on and the sock knitting began! Some of us even used a new technique taught to us by Hala – the German Long Tail cast on. Everyone is using pretty basic sock patterns. Well, everyone except Rain. Get this, she is knitting two socks on one circular, toe up and that’s not all – she’s making up the pattern as she goes along!!!! Here’s my sock progress so far. Not much, but knitting along with friends will help move these socks off the needles and onto my feet! This entry was posted in Dubai, KAL, Socks. Bookmark the permalink. i love it, there is no better way to get out of a knitting funk than to find your knitting ladies. it looks like it was an awesome time. it seems so exotic, knitting in the UAE. when does the bog move back happen? 🙂 it was great to meet you at the KAL! Gosh I’m nervous already about my socks hehe. Love your Dublin Bays, I still can’t get over how awesome the pattern is for the yarn! cant wait to see knit up socks!